Southwell, if you don’t know, is not just famous for the horse racing, but is one of the most picturesque towns in Nottinghamshire, characterised with an array of elegant Regency houses. However, its’ architectural treasure is the stunning Norman Minster, which possesses some of the best medieval stone carving in England. The minster was granted Cathedral status in 1884, although the small town (with a population of only 6,900) never became a city. The town also boasts a fully preserved Victorian workhouse and the Saracens Head pub where King Charles I spent his last night in May 1646 before surrendering to the army stationed at nearby Kelham. There is an abundance of history to this town, and plenty to see and do, so it’s well worth a visit. Masters of Vision is the brainchild of Nottinghamshire Landscape Photographer and Pete Bridgwood and was created to feature works of established master landscape photographers alongside some of the most talented emerging photographers. Each photographer has been given carte blanche in their choice of images and how to display them within their allotted gallery space. Alongside Joe Cornish, this years batch of photographers includes Anthony Spencer (Winner of LOPTY 2010), Dave Thomas, Steve Watkins, David Baker, Jonathan Horrocks, Mark Gould, Pete Bridgwood, and local Southwell resident Chris Upton. Each photographer, with the exception of Joe Cornish, has been provided 4 panels to present their work, housed at the Western end of the Nave. Joe however, takes pride of place and having 8 panels to display his work in the north Transept. Entrance to the exhibition and minster is free, but you are encourage to leave a donation and if you wish to take photographs within the minster there’s a five pound fee. I must admit I find the Masters of Vision title a rather pretentious, but never-the-less with works from the likes of Joe Cornish, Dav Thomas and Anthony Spencer on display I arrived with great expectation. I was familiar with most of the photographers, but works from David Baker, Mark Gould and Steve Watkins were entirely new to me. Out of these I found David Baker the most impressive, so wasn’t surprised to find out he was the winner of Outdoor Photographer of year in January 2013. His speciality are seascapes, which are quite minimalistic, slight blurry, very artistic, moody and occasionally stormy. His Shore (North West) stood out for me and whilst other impress I found a total of 10 rather similar images on display a little too much. One panel however, presented some rather nice tree shots, most I think from the New Forest. Two of these, a beautiful mono images Dawn Trees and March Trees, were perhaps my favourite images of the entire exhibition. One other picture that really caught my eye was Beach at Low Newton, by Jonathan Horrocks; a colour, square crop image, comprising a rather sparse beach/seascape that looked simply stunning. His other images included several minimalist cloud/seascapes, of which Dusk I liked, but his panoramic Storm Clouds I disliked the cropped clouds at the border, and a few other images seemed to have an odd magenta hue to them. One panel comprised a number of small, urban, monochromatic images printed on what appears to very white matt paper, but under the sparse lighting appear rather flat and dull. Pete Bridgwood presented a rather eclectic mix of images, but his panel of comprising a number of small, but very well printed, black and white/sepia prints stood out. Of these Chairs & Stairs appears very effective. Other panels included larger colour landscapes, of which mountain shots Alpine Glory and Icing Sugar, looked moody and impressive. His best image for me though, was Passing Cloud which could almost pass as a water colour painting. Whilst having some impressive images, Mount Light, a rather peculiar silhouette and Super Moon, looked sadly out of place amongst the others. Undoubtedly the most striking set of panels were those from Anthony Spencer, winner of the Landscape Photographer of the year in 2010. His winning picture Corfe Castle is included and at around 24 x 36 inches looks very impressive. Not only are his prints the largest on display, but also the most expensive, surpassing even those offered from Joe Cornish, with Corfe Castle and several others priced at a mere £799. Whilst large and beautiful composed I found Tony’s pictures a tad colourful for my likening, but they are impressive never-the-less. Two that stood out however, were Kirkjufell Sunset in Iceland, and the almost monochromatic Kimmeridge Ledge, both of which are stunning. Home town boy Chris Upton get pride of place at West Gate entrance and perhaps the best description to encompass his offerings is Travel photography. Some nice shots but not really my cup of tea; shots of Greece, palaces in Rajasthan, silhouetted camels, that sort of thing. Some of the prints seemed to have slightly odd colouration. I did however, really like his image of the much-shot Ashness Jetty whilst flooded, but my favourite by far was the Vortex, a spiral staircase spiral in Budapest. Steve Watkins is an award-winning travel photographer, however many of his images presented here seem rather oddly processed and unfortunately looked rather washed out under the available light. Images from Mark Gould included another eclectic mix, including landscapes from USA national parks Zion and the famous Mesa Arch in Canyonlands, alongside spall plant images. Best of these were Wast Water, Elgol & Loch Assynt. The most cohesive display by far was that from Sheffield based photographer Dav Thomas. He presents a body of work from his recent book With Trees, a copy of which was on display. His collection of uniformly sized prints (16 x 20 inches) presented the greatest impact. His images however I find rather mixed. Some are just extraordinary beautiful, others I find extraordinary ordinary. I found just the same within his book, although I know this work has many admirers. 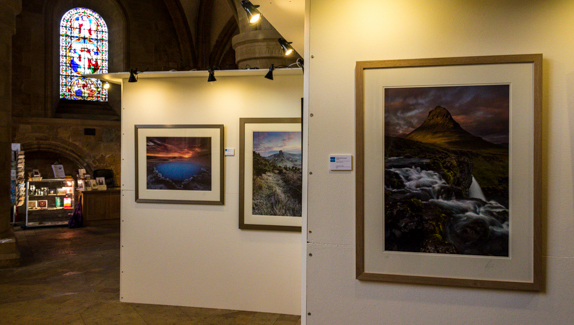 Images from Joe Cornish are displayed apart from the others, housed within the north transept where he has additional space to display his works. There is a mixed collection of old and some new, with a broad range of images from around the world, including a few from his private collection which are not for sale. His compositions are meticulous as always and can hardly be faulted, although I much prefer his landscapes to his abstractions. Stand outs for me were the two moody shots taken in the in Zanskar mountain range in Kashmir, and images from Antarctica and Svalbard. It’s not often you can enjoy such a collection of photographs for free, especially around my region. The minster is a most unusual setting and presents an atmospheric backdrop to a good selection of images which should intrigue and entertain almost any visitor. I struck lucky on my visit and was entertained by some beautiful choral work by the practicing choir. Having said that, the exhibition is sadly down by rather poor lighting. I found the 3 small halogen lights above each panel woefully inadequate. They barely lit the pictures hung towards the upper reaches of the panels let alone those hung below. Many images appear a little dull, flat and lifeless, and some seem to have some odd colorations. Many of these I’ve since reviewed online and they appear quite different. A lesson to be learned by the presenters here I think, but don’t let that put you off attending it’s still well worth a visit and you can enjoy the beautiful minster as well. You have to hurry though as the exhibition finishes on August 26th. Disclaimer: Copyright for the images used within this article are probably owned by either the original artist, the person or body who commissioned the work, or the heirs thereof. The author has used low-resolution images of these works for illustrative and commentary purposes as stated as ‘fair use’ under United States copyright law and no infringement of any original copyright is intended or implied.